"What is that you're doing with your voice?" asks Sudeikis. "Are you doing a character? Like a chimney sweep or something? Are you doing Winslet? What are you doing?" 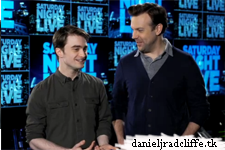 He later encourages Radcliffe to attempt an American accent, although brands Radcliffe's choice of phrase - "What up, dude, give me some hamburgers and pizza!" - as stereotypical.